What do you get when you combine the popularity of bone broth with the juicing phenomenon? One big healthy eating trend. So how does souping — which is basically a short-term soup diet — match up to juicing? While it promises to give your digestion system a break similar to juicing, it’s unlikely to lead to the infamous headaches, energy crashes and weight-gain rebound that juice cleanses are known for. Where juicing removes your food supply completely, leaving you with only the nutrient-laden water pressed out of whole-produce items, souping involves actually consuming food -- and plenty of it. Because of this, you can spend a few days or a week consuming healthful, whole-food soup meals without feeling deprived. If you use bone broth as the soup base you’ll receive even more benefits, such as reducing inflammation, improved digestion, joint repair and more. Some souping cleanses are very particular, such as Dr. Oz’s 3-Day Souping Detox, which instructs you to eat soup, including fruit soup, six times a day for three days and comes with a one-sheet shopping list. 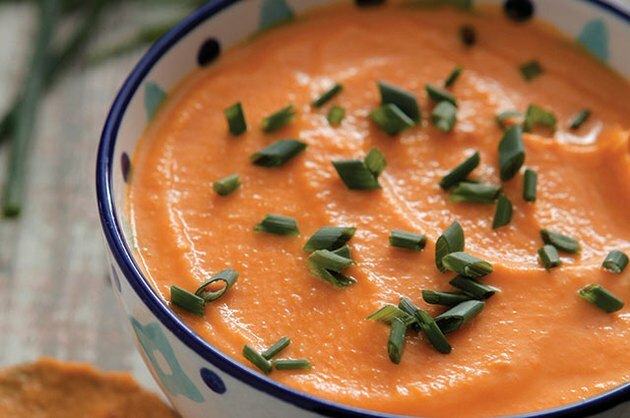 You can go this route if you prefer, but it may be easier and more enjoyable to instead choose your favorite ingredients and flavors and create your own souping protocol. I suggest alternating between “veggie blendies,” which is what I call simple blended vegetable soups, and soups or stews that contain more filling ingredients. If you’re looking to ensure you receive the potential health benefits of souping, avoid additions such as white-flour pasta or processed meat. Below are recipes from each of those categories to get you started that are delicious, satisfying and incredibly healthful. These, and about 50 others, can be found in my book, The Bone Broth Miracle. Butternut squash has more potassium than bananas and enough beta-carotene to reduce your risk of cancer. And it’s so tasty. Better yet, all you have to do to make soup out of it is cut it in half, scoop out the seeds, roast it, and blend. No need for complex cubing, and the caramelization from roasting makes for a satisfying flavor. Halve squash lengthwise and remove seeds. Place butternut squash halves skin-side down in a baking dish and drizzle with olive oil. Bake until tender, approximately 50 minutes. Once removed from the oven and cooled slightly, scoop the squash meat out of the skin and place in a blender. Blend squash, broth and sage until smooth. Add salt if desired. Shirataki noodles are the unsung hero of the noodle world. Low in calories, no net carbs and no fat, they’re a moderately nutritious filler food made of a fiber derived from konjac yams that absorbs any flavor you add to it. In grocery stores, you’ll find them near tofu, and some brands contain tofu. (Not being a fan of soy, I prefer the ones that don’t, such as NoOodle). 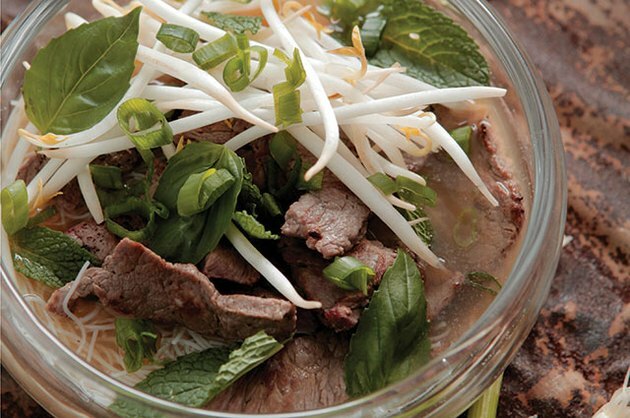 Garnishes: 1 cup each of bean sprouts, cilantro leaves, sliced scallions, lime wedges and thinly sliced Thai chili peppers. Cook shirataki noodles according to package instructions and set aside. Bring beef broth to a boil in a pot and add bouquet garni bag. Reduce heat to a simmer and infuse for 15 to 20 minutes. Remove bag and add sirloin, fish sauce and coconut sugar. Turn off heat. Stir briefly to cook steak. Add one cup of noodles to each bowl and top with soup. Garnish as desired. Have you ever tried souping or juicing? What did you think? Did you prefer one over the other? What are your favorite healthy soup recipes? Leave a comment below and let us know! Ariane Resnick is a private chef and certified nutritionist who specializes in organic farm-to-table cuisine and creates indulgent, seemingly "normal" food out of impecably clean, whole-food ingredients. She has cooked for such celebrities as Gwyneth Paltrow, Chris Martin, Matt Groening, Lisa Edelstein and Jeff Franklin. Ariane has also been featured in Well+Good NYC, InStyle, Star, Goop.com, Food.com, Huffington Post, Refinery29.com, Muscle & Fitness, Men's Fitness and the Food Network's Chopped. Connect with Ariane on her website and on Facebook and Twitter.